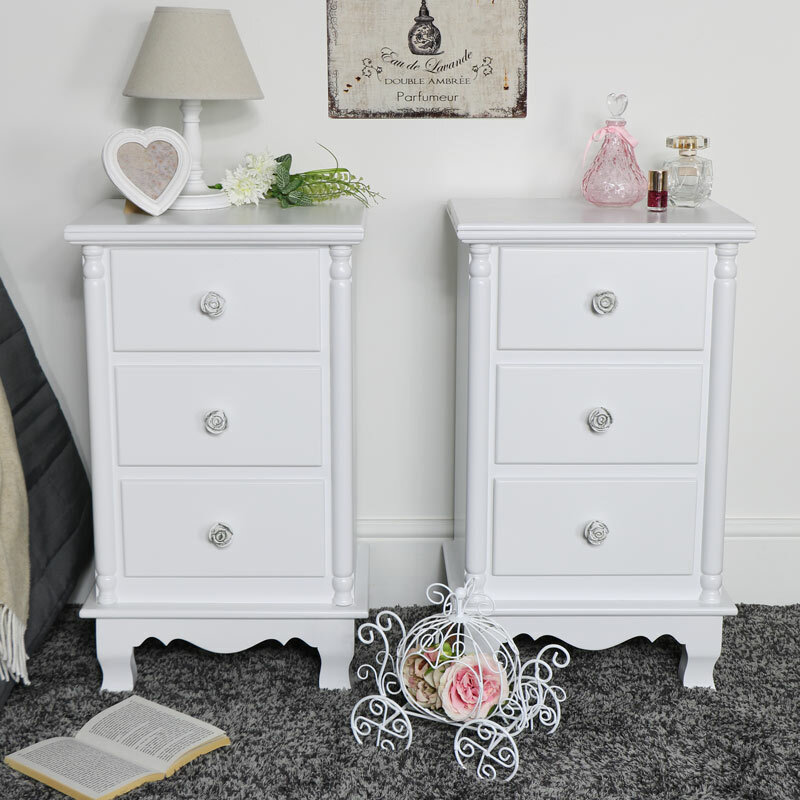 This is our Lila Range, a stunning collection of vintage inspired white,White bedroom furniture with items designed for predominantly for bedroom and living room use. 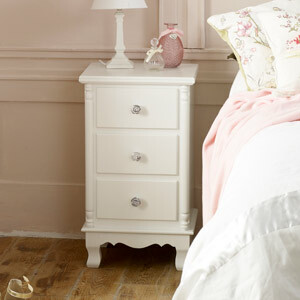 This gorgeous furniture set includes a full dressing table set, slim double wardrobe with a pair of bedside chests and a large chest of drawers. Perfect for lovers of shabby chic, vintage or french furniture and home decor. The Lila Range has a smooth satin finish and each piece is completed with delicate rose style handles to enhance the shabby chic feel. The Lila range is one of our most popular furniture collections due to its simple, slim design and excellent price. This Furniture set comprises of a single Wardrobe, a full Dressing Table Set, a Large Six Drawer Chest and a Pair of Three Drawer Bedside Tables. The wardrobe has a tall, slim design and includes two drawers, a shelf and a hanging rail - perfect for getting your clothing neatly organised. Also included in this furniture set is a large six drawer chest of drawers and a pair of three drawer bedside tables to make sure all of your storage needs are met. The last piece included is a gorgeous dressing table set, including stool, swing mirror and a fabulous two drawer console table. 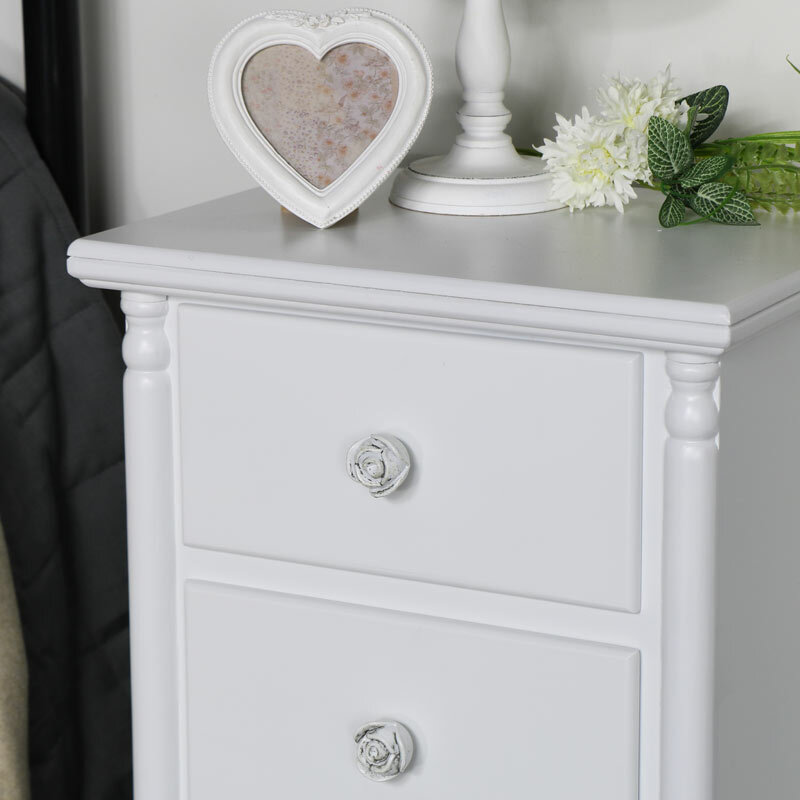 This is our Lila Range, a stunning collection of vintage inspired white,White bedroom furniture with items designed for predominantly for bedroom and living room use. 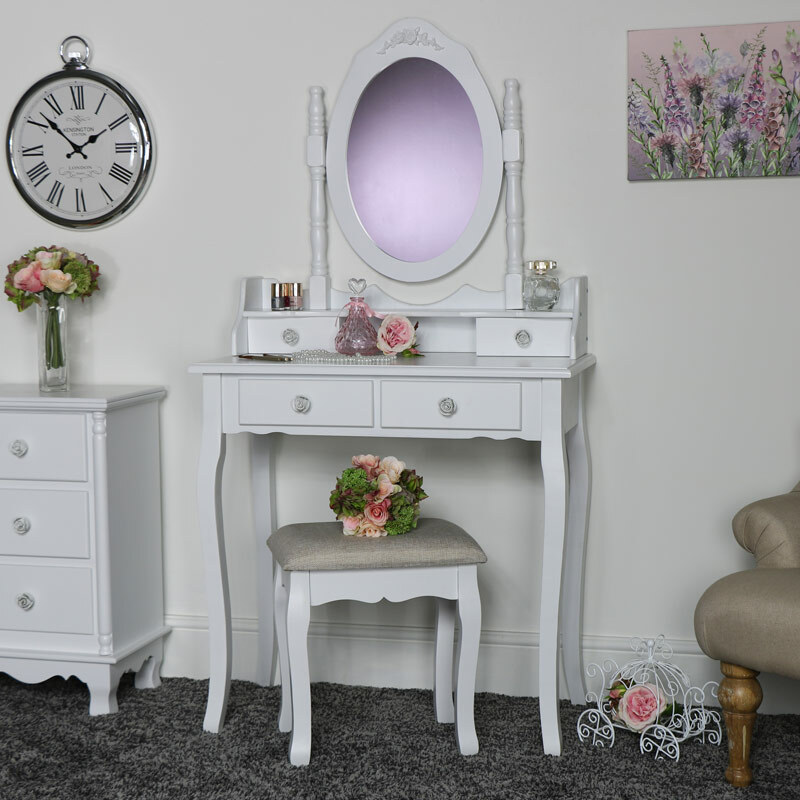 This gorgeous furniture set includes a full dressing table set, slim double wardrobe with a pair of bedside chests and a large chest of drawers. Perfect for lovers of shabby chic, vintage or french furniture and home decor. 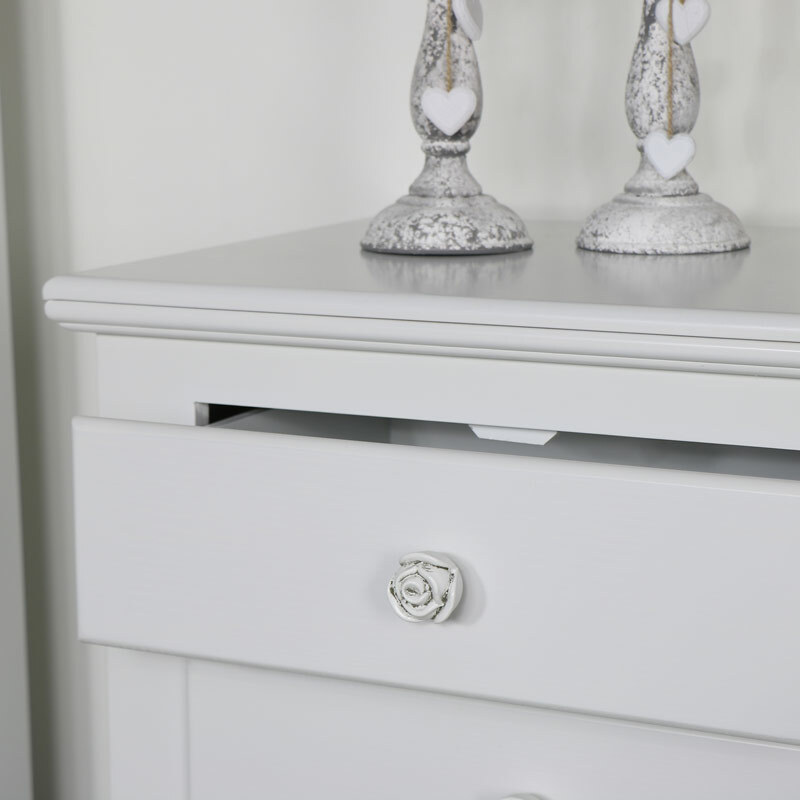 The Lila Range has a smooth satin finish and each piece is completed with delicate rose style handles to enhance the shabby chic feel. The Lila range is one of our most popular furniture collections due to its simple, slim design and excellent price. This Furniture set comprises of a single Wardrobe, a full Dressing Table Set, a Large Six Drawer Chest and a Pair of Three Drawer Bedside Tables. The wardrobe has a tall, slim design and includes two drawers, a shelf and a hanging rail - perfect for getting your clothing neatly organised. Also included in this furniture set is a large six drawer chest of drawers and a pair of three drawer bedside tables to make sure all of your storage needs are met. The last piece included is a gorgeous dressing table set, including stool, swing mirror and a fabulous two drawer console table.